Most of us would rather not consider the possibility of sustaining a serious burn and in that situation the last place we would expect a medical professional to look for a treatment option would be food waste but sometimes the most valuable things are in the oddest places. The skin of the Tilapia fish has been trialed as a dressing for 2nd and 3rd degree burns at the IJF (Institute Doctor José Frota) Hospital in Fortaleza, Brazil. The research was instigated by Marcelo Borges, a plastic surgeon who had spent three decades working on burn wounds. He read an article about the use of Tilapia skin in handcrafted products that mentioned that the other 99% that wasn’t used was a worthless waste product. Human and pig skins are already in use as a treatment in certain burns cases but these specially prepared, sterilised and stored skins are not available in high enough volumes to treat Brazillian burns victims. 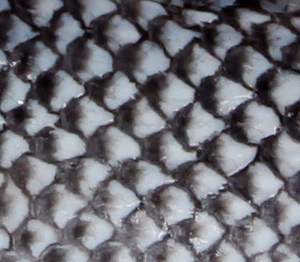 So Borges decided to investigate if Tilapia skin would be a viable alternative and it turned out in some ways to be superior with twice the amount of collagen type 1 and 3 (important in healing and scarring) and in some cases a single application of Tilapia skin can remain on the patient until scarring and healing occur which removes the painful changing of dressing required with a cream and gauze approach.